St. Louis blacks and white disagree on Michael Brown’s killing: Hold almost opposite opinion of police, protesters, and Officer Darren Wilson. We knew blacks and whites saw Michael Brown’s killing differently. A new poll shows the gulf that divides them is greater than anyone guessed. 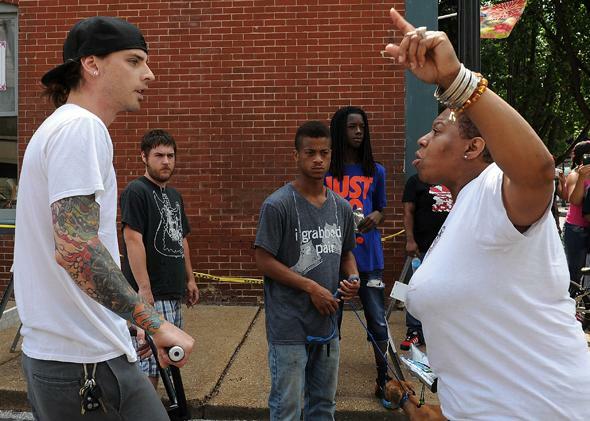 Two people argue during a protest of the shooting death of Michael Brown outside Ferguson Police Department headquarters on Aug. 11, 2014, in Ferguson, Missouri. That told us quite a bit about opinions nationwide, but it said little about views in St. Louis County, where Ferguson is located. Now, thanks to a new survey from the Remington Research Group—based in Kansas City, Missouri—we know. The firm polled 604 residents of St. Louis County on aspects of the controversy, from the shooting of Brown to the police response to protesters. And on most questions, they found a stark racial divide. When asked if “the shooting of an African American teen by law enforcement in Ferguson, Missouri” was justified, 62 percent of whites said it was, along with 35 percent of blacks. The “noes” were a mirror image: 65 percent of blacks—and 38 percent of whites—said it wasn’t justified. This, more than any result in the survey, is astonishing. Remember, we know little on the circumstances that led to Brown’s death. At most, we have witness reports, which say Brown had surrendered when he was killed, and the testimony of Officer Darren Wilson, who says he was attacked by the teenager. It’s impossible to say anything for certain, but my hunch is that this divide has a good deal to do with implicit racial bias and the divergent views of law enforcement among whites and blacks. Even in the best circumstances—where police were calm and protesters, orderly—there’s a good chance whites would have sided with law enforcement and its version of events. Given the reality, where police were heavily militarized and the protests had elements of disorder, white support for the police was inevitable. Larger than the divide on the shooting of Brown was the divide on the role of race. Just 23 percent of whites agreed that Brown was targeted because of his color, compared with 64 percent of black Americans. By contrast, a whopping 77 percent of whites said race had nothing to do with the shooting. And a similar number (72 percent) don’t think the police officer should be arrested and charged with a crime. Again, the number is reversed for blacks; there, 71 percent say he should be charged with a crime. Blacks and whites in St. Louis County disagree on nearly everything around Ferguson and Brown’s shooting. Just 39 percent of whites, for example, believe black Americans are “unfairly targeted by law enforcement” (compared with 70 percent of blacks), and the large majority of whites (71 percent) see county prosecutor Bob McCulloch as a fair and impartial actor in the proceedings, despite his personal connections to St. Louis police and his long-standing deference to the force when it comes to police shootings. Insofar that white and black St. Louisians share anything, it’s their disdain for the media (81 percent of whites and 50 percent of blacks said media made the situation in Ferguson worse) and for Gov. Jay Nixon’s handling of the unrest (62 percent of whites and 70 percent of blacks give the beleaguered Democrat an “unfavorable” rating). While in Ferguson, I wrote on the sharp divide between white and black residents in the suburb. Whites saw the protests as an unpleasant distraction—an unfair mark against a pleasant community. Blacks, on the other hand, saw them as necessary: a resounding response to police harassment and political disenfranchisement. If this poll shows anything, it’s the extent to which those divides define the entire area. Thanks to decades of white flight, segregation, and deep racial tension, blacks and whites in St. Louis County don’t just live in different neighborhoods—they reside on different planets.